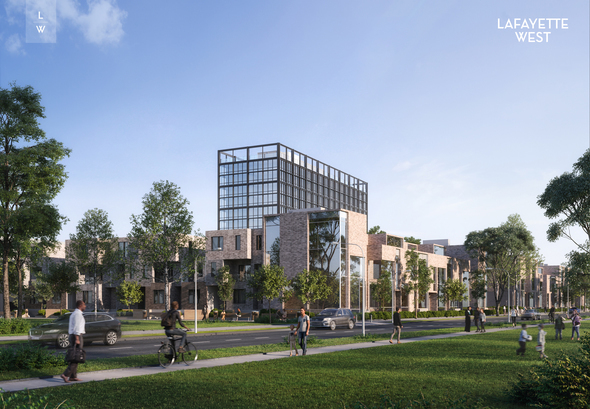 Ginosko Development Co. in Novi today announced Lafayette West, a $108-million residential development project slated to bring 374 new residential units to the Lafayette Park neighborhood east of downtown Detroit. The units include for-rent and for-sale lofts, townhouses, flats, and high-rise units. At least 20 percent will be set aside as affordable. The project is slated to cover 5.2 acres at 630 W. Ferry Ave., which is between I-375 and Rivard Street. This is where the vacant Shapero Hall is currently located. The hall will be demolished. The development is expected to offer a mix of new structures on the site, including a 12-story high-rise with 114 luxury rental units and attached parking, 200 lofts for rent, also with enclosed parking, and 60 for-sale townhouses, carriage houses, and stacked flats with attached garages. It will also feature green space. Every unit will be within walking or biking distance to downtown, major employment and recreational areas, and neighborhood shopping. The project will also include a rooftop terrace and a fitness center. Ginosko expects to break ground in early 2019. The project is expected to be complete by the end of 2020. The development will be subject to the city’s Community Benefits Ordinance (CBO), which requires a community engagement process for the development to move forward. The project is also subject to Executive Order 2016-1, which requires that 51 percent of the hours worked on the construction be performed by verified Detroit residents, or that the developer contributes to the city’s Workforce Training Fund to build the pool of skilled trade workers who live in the city. The CBO requires developers of projects of more than $75 million to engage with community members to negotiate a community benefits agreement. Ginosko will meet with community members this week to get initial input. A neighborhood advisory council will later be established to negotiate benefits with the developer. The developer will host six meetings throughout the summer. The first is scheduled for Tuesday, July 3. Residents in the impact area received the first meeting notice in the mail last month. Due to the shortage of skilled trade workers in Detroit, Executive Order 2016-1 allows for a contribution to the training fund that goes directly to programs that train the next generation of Detroit resident construction workers. The development will also include an affordable housing program for residents that will set aside 20 percent of the 314 rental units for households making 80 percent of area median income or lower. The area median income at 80 percent, set by federal housing rules, is about $38,000 a year.